Orange essential oil is derived from the steam distillation of peels of the sweet orange fruit (Citrus sinensis). Sweet orange is a citrus fruit that is native to China. However, this fruit is also cultivated in various part of the world. This sweet orange oil should not be mistaken for those of bitter oranges such as bergamot essential oil obtained from the peels of bergamot orange (Citrus bergamia). The main components in this oil include; citronellal, limonene, myrcene, neral, alpha-pinene, geraniol, linalool, and sabinene. 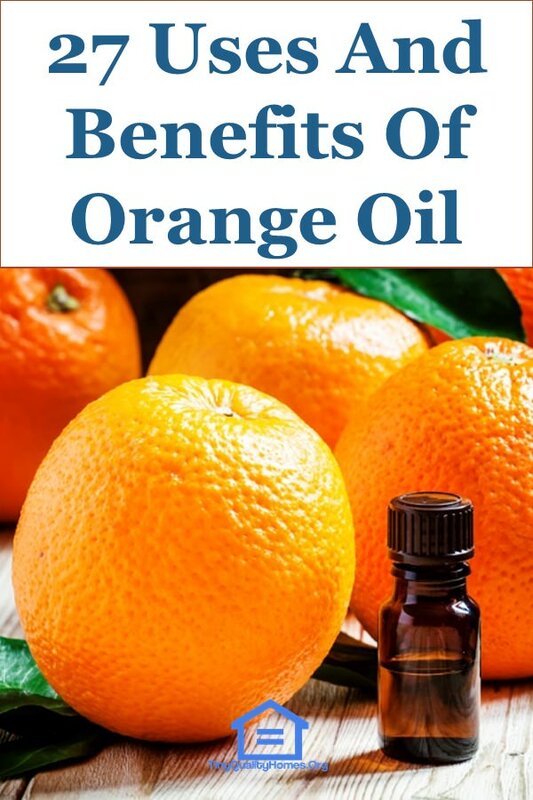 The health and therapeutic benefits of orange oil are due to its anti-inflammatory, antispasmodic, carminative, diuretic, tonic, antiseptic, aphrodisiac, sedative, and antidepressant properties. Sweet orange oil is relatively mild when compared to other citrus oils such as bergamot oil. However, since it is a concentrated mixture of numerous substances, it should be handled with care. Preferably, you could dilute it with a carrier oil before use. Orange essential oil can be used to strengthen your immune system. The active constituent available in this oil called limonene is a monocyclic monoterpene and it safeguards your body against all types of imbalances. Furthermore, the cancer-fighting abilities of this constituent are scientifically proven and tumor growth can be controlled to a great extent. Over a period of time, spasms may cause several critical health issues like diarrhea, muscle cramps, convulsions, and constant coughing. If you want to prevent these complications, spasms should be treated at the early stage itself. Orange essential oil can be used to prevent these spasms because it has excellent antispasmodic properties. This oil creates a relaxing effect to address nervous and muscular spasms. This oil has a very pleasant and invigorating smell and it improves your mood in a very effective way. Orange essential oil influences your brain’s olfactory system and thus, triggers positive emotional responses. This oil also creates a balancing effect on the hormones to enhance your mood. Orange essential oil can be described as an excellent natural antimicrobial agent. It offers you the best protection from most types of bacteria available in various meats. The spread of salmonella bacteria can be prevented with utmost efficiency and you can also use it to stop the fast reproduction of E. coli bacteria. These are the most common types of bacteria available and the antibacterial properties of this oil prevent the spread of these organisms. Orange oil in combination with a carrier oil, such as olive oil or coconut oil, is applied directly to control the inflammation on the sore muscles and swollen areas. If you are searching for effective natural remedies for addressing bone or joint pain, it is one of the best options available. This oil improves your pain tolerance and it ensures sound sleep when you have to deal with excess pain. If you want to get rid of fatigue, you can use orange essential oil. It can be applied to the pulse points of your body (such as wrist and neck) and this oil is absorbed by your body rapidly. This essential oil can also be added to bath water to have a revitalizing effect on the body. Respiratory allergens are the ones that make you vulnerable to seasonal allergies and they include mold, pollen, and mildew. Prolonged exposure to these allergens causes several health complications. These allergic reactions can be inhibited with the essential oil of orange. You would need to keep a small vial of oil and whenever you feel a tingling sensation in your nose, you can inhale the oil. It can also be applied in the palm or wrist using a ball of cotton to help alleviate symptoms of seasonal allergies. The orange oil can be utilized to enhance digestion due to its cholagogue property. This oil has carminative properties that lower flatulence and other types of stomach issues that create an aversion toward food. Improved secretion of digestive enzymes occurs with this essential oil and you can easily address constipation and gas related issues with it. If you want to eliminate bad breath, you can use orange essential oil because it has a stimulating and refreshing smell. Gum infections can also be addressed with this essential oil. Since it lowers the bacterial load in your mouth, the gum inflammation stays under control. If you are suffering from mouth ulcers, you can use this oil to numb the pain and control incidence. Orange essential oil has antibacterial, anti-aging and antioxidant properties. You can use it for improving your skin health. Furthermore, this essential oil treats acne and aging-related problems in an effective way. Its benefits include elimination of bacteria, improved collagen production and effective protection against UV damage. Orange peel contains flavonoids that are equipped with hypotensive properties. These compounds are the reason behind making orange oil an effective option to control blood pressure. Various research studies have shown that the citrus flavonoid, naringin, possesses cardio-protective and antihypertensive properties as well. In addition to controlling blood pressure levels, orange essential oil enhances blood circulation effectively. Improved blood flow ensures better protection against hypertension and you can control PMS-related symptoms as well. Orange essential oil is often utilized in aromatherapy to take people out of a depressive mood. The refreshing smell of the oil makes you energetic and you can experience a sense of happiness and relaxation as well. This oil lowers the secretion of cortisol and can mitigate symptoms of anxiety and depression. When it comes to reducing cellulite, orange essential oil is one of the best options available. The diuretic properties of this essential oil make it an excellent choice for relieving fluid retention and it also gets engaged in the process of softening the epidermis. Furthermore, enhanced blood circulation and better stimulation of lymph fluids, due to this essential oil, work well to treat swollen tissues effectively and, as such, the appearance of the cellulite could be reduced. Orange essential oil has outstanding antiseptic properties. Harmful germs enter into the body through cuts or wounds and this situation could make you vulnerable to infections. As such, you should clean the area immediately before applying antiseptics to prevent infection. Antiseptic agents, like orange essential oil, disinfect the area to prevent microbial growth and you can use this oil for disinfecting insect bites, scrapes, and cuts. Several people are suffering from arthritis these days and the resultant pain and swelling may create extreme discomforts. The most prominent factors that make people vulnerable to arthritis are autoimmune diseases, cartilage loss, and bone deformities. Regardless of the reason or cause, the prominent symptoms of arthritis are severe inflammation. The anti-inflammatory properties of orange oil make it an effective remedy to offer relief. The most popular way of using this essential oil is to mix 10 drops of this oil with one tablespoon coconut oil and this mixture should be melted over low heat. It should then be applied to the affected area and you need to keep on rubbing so that the mixture is fully absorbed. This essential oil assists your body in eliminating unwanted toxins via urination. Urination is a process that gets rid of numerous types of toxins as well as excess water, pollutants, unwanted salt, bile, and uric acid and you can expect healthy urination with this oil to keep your body clean and healthy. Proper urination improves water consumption and it also encourages digestion in the best possible manner. Alzheimer’s disease reduces the quality of life in a serious way. Various studies have shown that aromatherapy with the help of orange essential oil offers great benefits for Alzheimer’s patients. It enhances the cognitive function. As such, the Alzheimer’s disease-related complications can be controlled to a certain extent. Another prominent use or benefit of this oil is that it eliminates the larvae and pupae of houseflies with great efficiency. You can get rid of the problems caused by houseflies which can result in serious types of allergies and infections. The perfumes you purchase from stores contain a lot of chemicals and they may cause some side effects in the long run. This problem can be easily avoided by making a perfume of your own using orange essential oil. An excellent perfume can be prepared if you combine this oil with vodka and jojoba oil. In order to create the scent you need, you can add other oils such as lavender oil, grapefruit oil or peppermint oil. Orange oil is effective in controlling discomforts associated with cough and cold. Two or three drops of this oil need to be added to a bowl of hot water and you can have steam inhalation to enjoy excellent relief from cold and cough. A lot of us use leather sofas and furniture and this oil can be used for moisturizing leather sofas and furniture. For moisturizing purposes, you have to create a mixture comprising of orange oil, white vinegar, and flaxseed oil and it should be applied with the help of a soft clean cloth. This essential oil is also effective in easing flatulence in babies and it can also be utilized as a solution for diaper rashes. Orange essential oil can be described as a natural diuretic and it helps in stimulating the lymphatic system, bladder, and kidneys. The detoxification process becomes effective and impurities, as well as uric acid and bile, are effectively expunged from the body. If you want to clean the floor effectively using a natural substance, orange essential oil is certainly a very good choice. You can stop using chemical-laden cleaning solutions that contain dangerous additives. In addition to cleaning the floor, the orange oil creates a pleasant smell in the room. Orange oil and vinegar should be mixed and this mixture can then be poured into a bucket of water to make the cleaning solution. As mentioned above, orange essential oil has antiseptic qualities and this makes it an excellent choice for disinfecting surfaces such as kitchen counters, cutting boards, and dining tables. Orange oil is a popular ingredient in several cleaning products. Unfortunately, most of the commercial cleaning solutions contain a lot of harmful chemicals and they cannot be used in areas where you prepare or serve food. This natural oil allows you to make your own disinfectant solution and there is no need to worry about any harmful effects. You can even clean door knobs and handles to prevent them from becoming breeding grounds for harmful germs. Ants are a common source of concern for several people, especially farmers. If you are having difficulty using other methods to control ants, you can use orange essential oil. Nowadays, several organic farmers are using this oil to deter ants and it can be utilized to repel an entire ant colony. As such, the use of orange essential oil is an effective, non-toxic pest control method.